If you've read my blog for a while then you'll know I'm a big fan of sale shopping, especially for my daughters. Who doesn't want to save 50%+ off RRP? I fill Isabella's (and now Poppy's) wardrobe with sale purchases every year, which means I only have to properly shop for her twice a year - summer and winter. 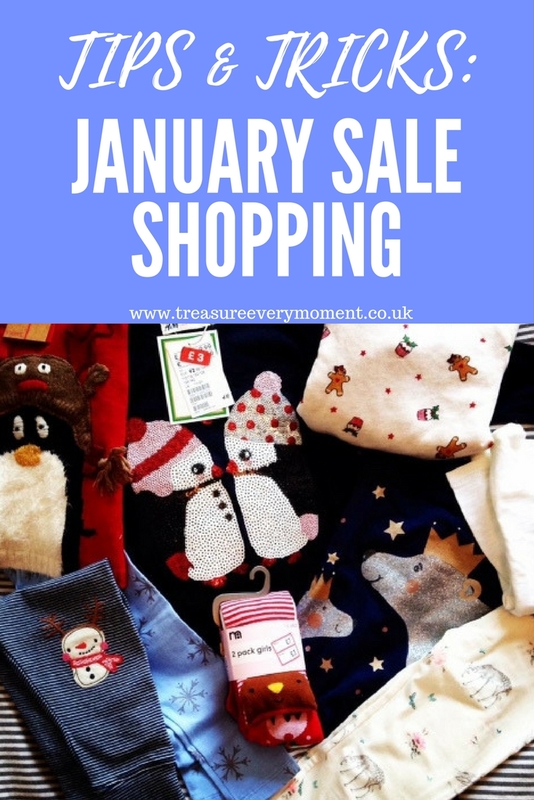 Buy for this time next year - When it comes to sale shopping for my daughter I have always shopped in the sales for the following year. So at the moment I am buying 2-3 years clothes for next autumn/winter. It saves so much money and means I can dress Isabella in the type of clothes I love to without breaking the bank. All of her Christmas outfits this year were sale purchases last year, often bought with over 50% off RRP. There are two slight downsides to this sale shopping technique - you need the space to store the clothes and you have to predict what size your child will be in a years time. We've been lucky in the fact that Isabella has always been true to size, i.e. at 22 months she's wearing 18-24 months. Be patient - Sales start small and get better and better, though obviously stock reduces massively over this time. A lot of toddler clothes shops (Mothercare, JoJo Maman Bebe, H&M etc.) started with 50% off around Christmas day with reductions increasing relatively quickly. Mothercare has already gone up to 70% reductions on a lot of their clothes and accessories, while JoJo Maman Bebe often increases to 60% within the next few weeks. I usually wait to buy items that I'm not as desperate to buy, so I wouldn't wait for a dress I had really wanted for a while but would wait for a 5 pack of vests that I predict wouldn't be as popular to the public. It is a guessing game and you won't always get it right, but it can be a good way to manage your sale shopping. If the product goes out of stock then you've saved yourself the pounds. Order online as soon as the sales start - Personally I don't like the idea of battling through endless crowds to pick up bargains, I'm just not that dedicated. I always ensure that I research when the sales will start (or increase in reductions happen) and then get online to make an order. A lot of shops will let you click and collect for a lot cheaper than home delivery and you can do your sale shopping from the comfort of your home. When it comes to online sale ordering from Next I found click and collect didn't work very well because some items would be out of stock (to be available in 3-4 weeks etc.). This meant that in previous years I've had to go to our local Next store over three times to pick up separate items from one single order. It's just something to bear in mind, as it can become a bit of an inconvenience. Be prepared - I like to make a list of shops on my phone that I'll keep an eye out for sales and increase in reductions. This includes Zara, Mothercare, JoJo Maman Bebe, Marks and Spencers, George at Asda, F&F Clothing, TU at Sainsbury's, Mini Club at Boots, GAP, Next, Joules, Boden, John Lewis, Debenhams, Verbaudet, Matalan and H&M. Not forgetting the more unique companies like Lottie & Lysh, Fred & Noah, Little Green Radicals, Little Chickie, Frugi, My 1st Years, Blade & Rose, PJ Mamma and Piccalilly. It's always a good idea to check back every now and again, with the hope you'll see their increase in sale reductions before they email them out to the masses. What are your top sale shopping tips?